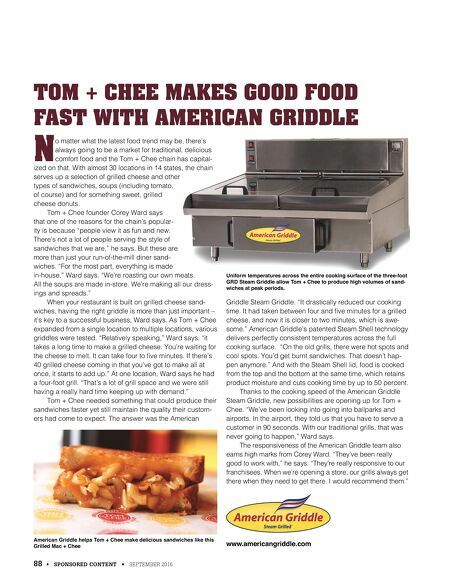 1 SEPTEMBER 2017 • FOODSERVICE EQUIPMENT & SUPPLIES • 89 (877) 959-8931 americangriddle.com The Steam Shell Griddle offers benefi ts far beyond that of conventional griddles or any other grilling device currently on the market. • Consistent Results • Instant Recovery • Error Proof • Faster Cook Times • Better Quality Food toasted on a flattop. It's a process he maintains is "absolutely mission critical to a Dat Dog." Expanded considerably from the original Freret Street location, the full menu today celebrates both traditional craftsmanship and contemporary twists on regional specialties. It has also been strategically refined to bypass the veto vote. "If someone in a group feels like a burger or is vegan, we have them covered," DiPaola says. "If someone's avoiding carbs, we have the Greenie Weenie, which is any sausage or other protein that you like wrapped in a ro- maine lettuce leaf instead of a bun." 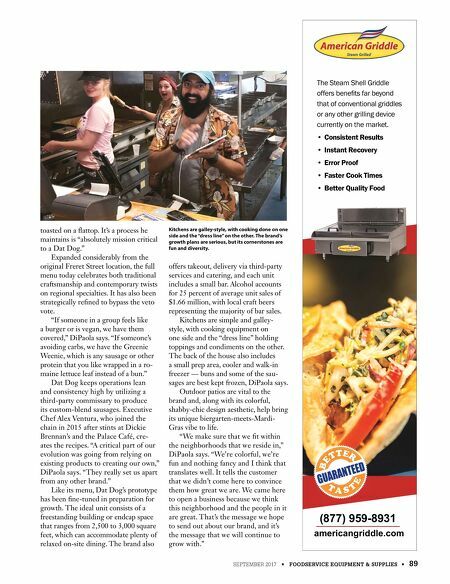 Dat Dog keeps operations lean and consistency high by utilizing a third-party commissary to produce its custom-blend sausages. Executive Chef Alex Ventura, who joined the chain in 2015 after stints at Dickie Brennan's and the Palace Café, cre- ates the recipes. "A critical part of our evolution was going from relying on existing products to creating our own," DiPaola says. "They really set us apart from any other brand." Like its menu, Dat Dog's prototype has been fine-tuned in preparation for growth. The ideal unit consists of a freestanding building or endcap space that ranges from 2,500 to 3,000 square feet, which can accommodate plenty of relaxed on-site dining. The brand also offers takeout, delivery via third-party services and catering, and each unit includes a small bar. Alcohol accounts for 25 percent of average unit sales of $1.66 million, with local craft beers representing the majority of bar sales. Kitchens are simple and galley- style, with cooking equipment on one side and the "dress line" holding toppings and condiments on the other. The back of the house also includes a small prep area, cooler and walk-in freezer — buns and some of the sau- sages are best kept frozen, DiPaola says. Outdoor patios are vital to the brand and, along with its colorful, shabby-chic design aesthetic, help bring its unique biergarten-meets-Mardi- Gras vibe to life. "We make sure that we fit within the neighborhoods that we reside in," DiPaola says. "We're colorful, we're fun and nothing fancy and I think that translates well. It tells the customer that we didn't come here to convince them how great we are. We came here to open a business because we think this neighborhood and the people in it are great. That's the message we hope to send out about our brand, and it's the message that we will continue to grow with." Kitchens are galley-style, with cooking done on one side and the "dress line" on the other. The brand's growth plans are serious, but its cornerstones are fun and diversity.